Grilling season may be over, but if you want to fire up the grill without a hitch next spring, there are some important care tips you should follow. After you’ve given your grill a good cleaning, The Family Handyman recommends coating the metal grill parts with cooking oil to repel moisture and prevent rust. After you’ve applied a coating, wrap the burner unit in a plastic bag to keep insects from nesting in the gas tubes. For outdoor grill storage, keep the propane tank off but connected, and wrap the grill with a protective covering. If the grill is stored indoors, leave the tank outside in an upright position away from furnace and dryer vents. Even a small gas leak can cause a large explosion if the tank is stored in a confined place like a shed or garage. Once the propane tank has been disconnected, you can safely wheel your grill into the garage or your backyard storage shed. Once you’ve taken the necessary steps to properly winterize and cover your pool, consider storing your pool accessories in one place by using portable and durable storage containers. PoolCenter.com not only offers fun pool accessories, the online pool parts and accessories retailer sells poolside storage solutions that make packing up toys and games easy. Warm weather gear can’t be left out in the cold. Avoid rusting, warping and cracking by storing gear in a safe, moisture-free area. Warm weather sports gear like kayaks and bicycles must be stored properly to avoid damage. Smart Start Kayaking recommends storing the vessel in an upright position on its stern during the offseason. This position limits the amount of stress on different parts of the kayak, and many plastic kayaks can warp or bend if they’re stored differently. Other kayak storage solutions include tilt racks, sling and hoist systems or mounts that can be adhered to garage or shed walls. When you’re putting you bicycle up for storage in the wintertime you must first make sure that every part of the bike is in working order. About Sports recommends inflating the tires, wiping down and inspecting the frame, lubricating the cables and cleaning the chain, wiping down the saddle and handgrips and inspecting the wheels and brake pads before storing. Taking care of your cycle in the offseason will make it much more enjoyable to bring it back out and go for a ride in the spring. REI offers multiple bike storage options like hinges, hooks, wall mounts and ceiling storage racks that can work in garages, spare rooms or storage units. Whether you are at home, at a public place, your office or health club, you need appropriate means to keep your belongings in an organized manner. Without them, it would be impossible for you to maintain order and sanctity of a place or find what you need when you need them. In order to facilitate smooth running of operations, you need to get lockers that will help you to store your necessities in a secure way. There are a wide range of lockers or storage compartments available in the market, and depending on your requirements, preferences and budget, you can choose one or many to keep your belongings or arrange for others to do the same. Students in schools and colleges often have special storage requirements that need to be fulfilled by aptly built locking systems. They usually have to carry a large amount of books, exercise copies, drawing and artwork supplies, gym clothes and supplies and a host of other materials. Within the school premises, they usually get very little time within each subsequent period to retrieve their necessary belongings. For this reason, they need to set up a method by which they can get what they need and yet won’t be late for their next class. Hence they need to have the right kind of storage compartments to keep all their goods and equipments. As the authorities of a school, it is your task to provide them with the best locker systems so that they can make the best use of their limited time. There are different types of locker systems available in the market and particularly used as school locker devices. These include wood locker systems, metal locker systems and box locker systems. They are available in different sizes as well, such as the standard size models, extra wide models and even the vented ones. They can be used for storing anything from books, projects and journals, and the vented models are especially preferred in gyms where shoes and clothes are needed to be stored. You can also get high quality storage systems in plastic and standard metal frames. These are available in single and double tiers as well as in box styles and extra wide triple tier designs. The wooden storage components are constructed by using superior materials that are quite easy to clean as well as maintain. The wide range of tiers and sizes that are associated with these wooden locker systems makes it possible for users to fit them into both large as well as small spaces. Besides schools and educational institutions, they can also be used in restaurants and hotels for their stylish and classy appearance. Another popular option for storage compartments are the box locker systems. Besides being widely used in banks and official companies, they are also frequently used in schools and educational institutions. Their small sizes make it possible for them to be conveniently fitted into small spaces and serve as great storage options for keeping important files and documents. They are also available in numerous attractive designs which make it possible for users to opt for models that seem to be aesthetically pleasing to them. The plastic locker systems are among the most widely used storage components in schools and colleges. These are available in numerous designs such as box style compartments and single tier, double tier or triple tier units. Often wide and long, these storage compartments come with anti-microbial and anti-odour features which help them to remain fresh even when wet clothes or other components are stored in them. They are widely used in schools, colleges, gyms, health clubs, swimming pools, offices, etc. Most of these storage devices come with anti-corrosive properties which keeps them in perfect condition even after years of usage. The paint in these storage systems remains intact throughout its overall life, which eradicates the need for a paint job. Whether it is a business, a public service sector or some other entity, the need for suitable lockers cannot be undermined at any condition. It is for this reason that people often invest a lot of time and money in searching for the right kind of locker systems for their personal and organisational requirements. If you are looking for locker systems for your own usage, then a good way to do so would be to search for them over the internet. There are numerous companies at present that offer high quality storage systems for their clients. Their products have been widely preferred by users within the United Kingdom as well as in other parts of Europe as well. So if you are looking to get industry standard lockers that are made of the finest materials, then browse through their product catalogue today as you are sure to find what you are looking for. My Self Richard Parker. As per the graduation, I’ve completed my MBA from the top most university of Chester. After completing, I joined Shelvingstore as a Store Executive. Right now, I am working as a Store Manager there. Along with my Job, reading and writing is my hobby. And I have interest in IT field from early school days, I am passing some time to research on it. I am also doing online Blogging, specially on Lockers subject. I am contributing on top Blogging platform like WordPress and Blogger. All and All, I am Techno Geek with Management skill. First, pack a bag of necessities, like a change of clothes, your toiletries and a cellphone charger. Then, head to the store for some moving boxes, but don’t get too many. Grab one for each TV you have as well as some medium sized ones for kitchenware and office supplies. You can also find free boxes at places like Craigslist, grocery stores, U-Haul box exchange and recycling groups. Instead of using cardboard boxes to pack everything, utilize laundry baskets, drawers, suitcases and plastic bins. Use clean clothes and socks as padding in boxes with breakables instead of buying tons of bubble wrap. Keep plastic baggies handy to hold small screws and nails from items you take apart, such as curtain rods. Also, leave out scissors, tape and a Sharpie. To keep them wrinkle and tangle free, hang curtains and blinds in a wardrobe box with clothes. Or consider buying custom draperies when you get to your new place. Pack room by room and group similar sized and shaped items together. You wouldn’t pack a houseplant in a box of books, but DVDs mixed with classic novels will be just fine. Label each box and consider color coding too. Assign a color to each room. It will much easier to unpack. If you can, convince a few friends to help you with the move. Give them first dibs at the stuff you aren’t going to keep such as old furniture and clothes. Assign one or two people to stay in the truck while others carry each load. They’ll be responsible for stacking it tightly. Lay a tarp down to protect from dust and grime. Load the largest, heaviest furniture first and stack it in the back and up against the sides of the truck to distribute weight evenly. Try to pack as tightly as possible, like you’re putting together a jigsaw puzzle. Disassemble whatever you can, such as tables and furniture made from participle board. Use plastic wrap and moving pads for breakable items such as TVs, picture frames and mirrors, but try to use blankets, quilts and towels for everything else. Slide mirrors and photo frames between mattresses for extra padding. This is where color coding or number labeling comes in handy. Instead of unloading each box in the living room, have helpers drop off items depending on the room they’ll end up in. When you want to unpack and set up your bedroom, everything you need will already be in there. If you don’t know where to start, it’s best to tackle the kitchen first. That way you won’t be living off of cold cereal and fast food for the first three weeks after you move in. When you are a project manager for a construction company, you have to work against various challenging situations – deadlines that are always lingering near, mindful of legal constraints and managing the various aspects of the team doing the job. A typical day on the site will have a number of materials being moved in and out of the job site. To ensure that the work goes smoothly, you will have to organize things like when to bring the materials on site, where to store them and how to dispose them. Keeping the site organized and bringing only the materials that you need for the ongoing part of the job is a necessary step to remove unnecessary obstacles and make sure your workers have a safe environment to work in. But it is also a good practice to keep the things you will need in your construction work in the near future ready. So where will you put them if not on site? Hiring self storage units is a great way to keep your materials readily available and in secure storage. Below we explain how contractors can benefit from hiring storage space and why it is increasingly becoming a necessity in the business. Each day, your team will be handling different tasks which will require either some new material or more of the same. Procuring supplies daily from the wholesale source will not only be expensive, but also very time consuming. It is better sense to buy in stock and store them in self storage, from where you can take as much as you want, when you need it. If you keep according to the proposed plan, you can anticipate what materials you will need for the next day’s work and it will be easier to get them to the site. This is why you should choose a storage facility close to the project site. This reduces transit times to a great degree and you can be assured that your work can always proceed uninterrupted. As much as you try to stick to your project plan, there are chances that you will face some unexpected scenarios. Some of these may make excess demands on the materials in stock. Any experienced project manager will know that when you are working on a construction project, whether big or small, you will have to make allowances for buying extra materials and keeping them in stock. In case it turns out that your estimate was incorrect and you used up more ingredients, or if some of the material or equipment is damaged for whatever reason or if everything is going fine and you are moving ahead of schedule, all these scenarios will need you to have the required material on the standby and ready to go. Although you cannot always know when and how much extra material you will need, it is always good to have enough in stock so that the work does not come to a halt while you arrange for the deficit amount. The same is true for equipments as well. While your company might already have a storage space for them, keeping them close by along with the materials makes it easy to access them on short notice. Construction material and equipment is very expensive and their worth can run into very large figures. As such, leaving them unguarded with so many people going in and out of the site constantly makes it easy for a few items to be removed. 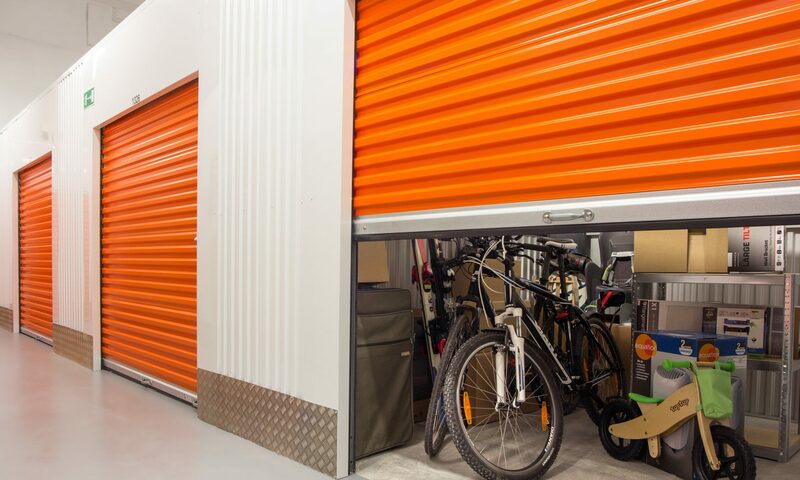 A storage unit is secure and will grant only limited access, making it easier to protect materials and intangible assets.